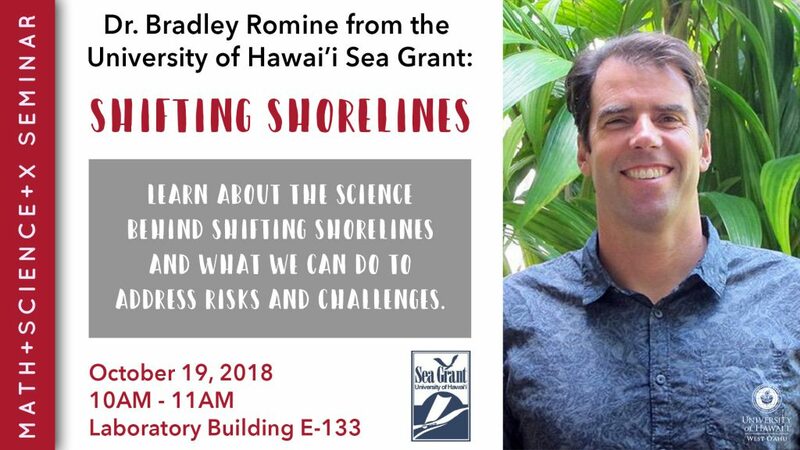 Dr. Bradley Romine, a Coastal Processes Specialist with the University of Hawaiʻi’s Sea Grant program, will give a talk titled “Shifting Shorelines” as part of the Math + Science + X seminar series. Romine’s lecture is scheduled for 10 to 11 a.m., Friday, Oct. 19, in Room E-133. His talk comes as beaches in Hawaiʻi are undergoing long-term landward retreat, with high tide and high wave flooding threatening development in many low-lying communities. Science points to these hazards occurring more frequently and more severely in the coming decades. Romine will be discussing the science behind these measurements and predictions, and what we can do to address the risks and challenges. Romine earned his bachelor’s degree in physical geography from the University of California, Santa Barbara, and master’s and Ph.D. degrees in geology and geophysics from the University of Hawai’i at Manoa. Romine’s role as Sea Grant Extension faculty is to “bridge the gap” between science and policy to improve coastal zone management in Hawaiʻi. He provides technical guidance, consultations, site visits, and public outreach on behalf of the DLNR-OCCL Coastal Lands Program and Sea Grant, and interfaces with other government agencies and the public on collaborative projects related to coastal hazards including beach erosion and sea-level rise impacts, according to Sea Grant. Tagged beach erosion, Bradley Romine, Sea Grant, sea-level rise, University of Hawaiʻi-West Oʻahu, www. Bookmark the permalink.